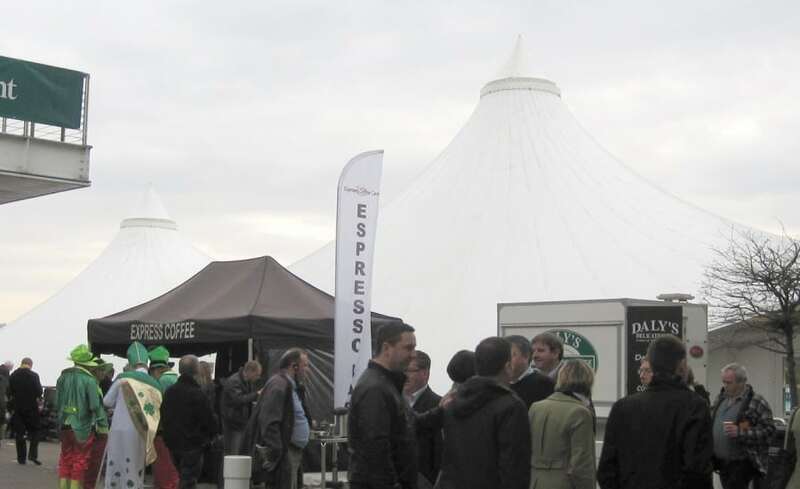 The Gold Cup is one of the highlights of the racing calendar and Cheltenham provides the perfect venue for such an up-market event. 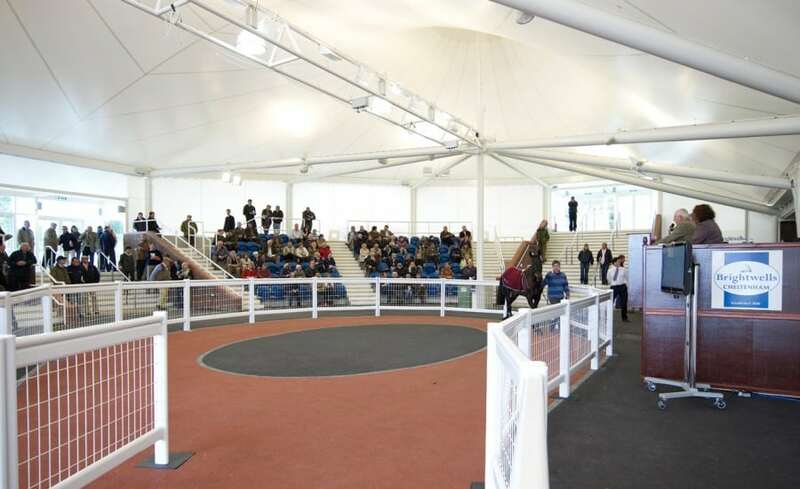 So when there was a need to build a new Horse Sales Ring on the site, it had to be visually stunning as well as practical in order to fit in with the existing surroundings. The primary initiative of the client was to create a covered space which would protect 150 people seated, with wheelchair access and stepped terraces, however, the aesthetics were extremely important. 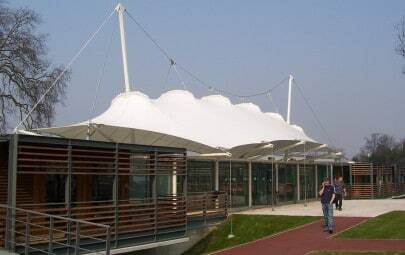 Working from initial conceptual drawings supplied by the Architect, Architen Landrell provided options for a tensile fabric roof to cover the completed structure. 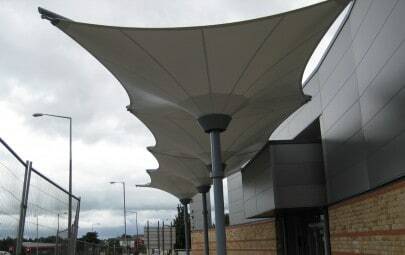 Situated close to the south end of the Main Grandstand and in close proximity to the New Centaur building, the proposed twin conic canopy design was then developed into an achievable, practical and aesthetic fabric scheme which met the clients requirements and compliments the surrounding structures. 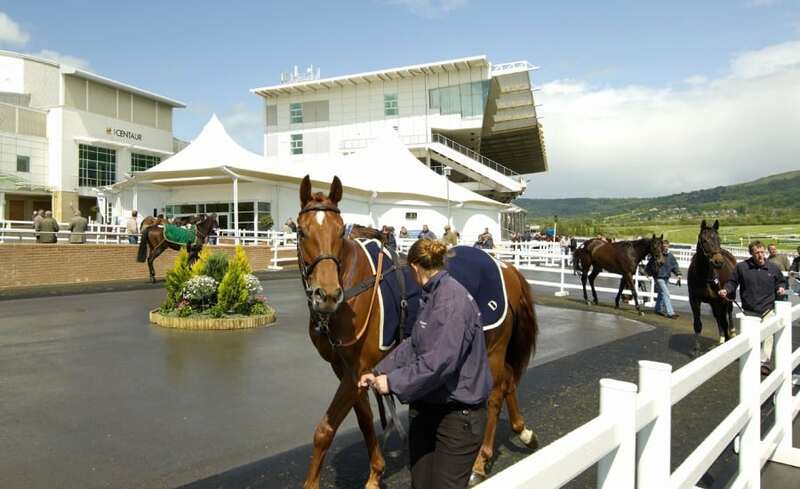 Upon the success of the design schemes, Architen Landrell was commissioned to design, engineer, manufacture and install the supporting steelwork, double layered fabric roof canopy, removable side walls and horse entrance doors. As primarily a summer use space it was important that the PVC fabric sidewalls and horse entrance doors were designed to be readily installed and removed as required, to allow the space to be fully enclosed during poor weather. The fabric structure was manufactured in PVC coated polyester so that the removable doors could be most easily stored and maintained. Equally, it provided the most cost effective option for the client without compromising the overall look of the fabric feature. Due to the size of the membrane structure it was necessary to design into the scheme a system to deal with the rainwater. Drainage is by means of upstands along the perimeter of the outer membrane, which channel rainwater towards the membrane plates, into flexible drainage pipes and down into rainwater pipes to underground services. 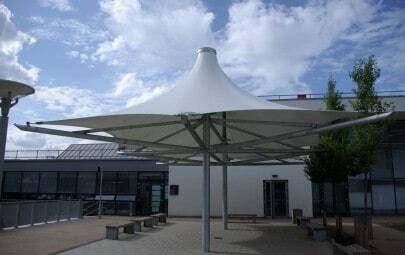 The fabric canopies were fitted to the glass entrance lobbies to prevent water entering the building. The main challenge was the installation of the outer fabric membrane and inner liner. The size and weight of the dual membrane meant we had to use multiple cranes meant that once the lifting operation had commenced, it had to be completed in one go. We worked late into the night to ensure the fabric and the structure were both safe and secure. Once the fabric was in position, tensioning was achieved by the jacking up of the two headrings, supporting the twin conic fabric roof, while lateral tensioning incorporated steel cables and membrane plates. Thankfully, due to good weather, a well co-ordinated installation team and carefully planned lifting procedure, the installation went well and was a complete success. The finished structure is a striking addition to the Racecourse environment and all involved are thoroughly pleased with the results.